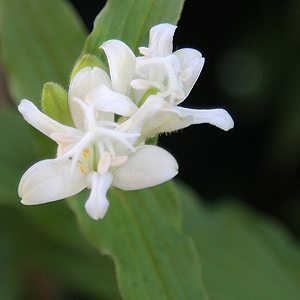 If you are looking for an autumn flowering plant with unique flowers then what is commonly called the Toad Lily, (Tricyrtis hirta) could be the answer. A wonderful woodland type plant with pretty spotted star shaped flowers they love a moist position in dappled shade, but away from cold winds. Tricyrtis hirta alba ‘Empress’ or Empress Toad Lily is pictured right. Flowers vary from almost plain white through spotted yellows and deep carmine pinks. Also known as Toad Lilies for some reason which is unclear to us as the flowers remind us of orchids. With orchid like flowers, these wonderful plants are not bulbs but rhizomatous perennials, and although they can be grown from seed if you are starting out, go for established plants. 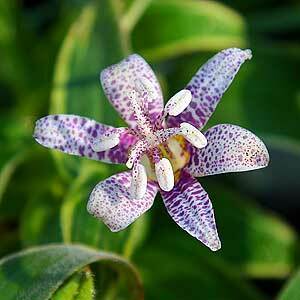 Originally from Asia (Japan, Taiwan and China) Tricyrtis hirta is probably the most widely available in Australia. Tricyrtis hirta ‘Miyazaki’ is the ”Miyazaki” Toad Lily, flowering in late summer to autumn and reaching around 60cm in height. Grows well in filtered shade and copes with dry soils. Choose a humus rich soil in part shade. Morning sun with afternoon shade is suitable. Make sure the soil is moist however not soggy. Plant the rhizomes at around 8 cm (3 Inches) deep. Fertilise with a liquid seaweed fertiliser and top dress with aged manure and compost each spring. Established clumps can also be divided in spring. Although they can be grown from seed if you are starting out, go for established plants.They can also be propagated from root cuttings. A humus rich moist soil, grow alongside Dicentra, Hosta and Trilliums. They can reach a good height 50 -70 cm, so a little room is required. Plant around 8cm deep. Tricyrtis hirta can be grown in good sized containers if required.